Sophomore guard Collin Gillespie has emerged as a third leader for Villanovato go along with co-captains Phil Booth and Eric Paschall. 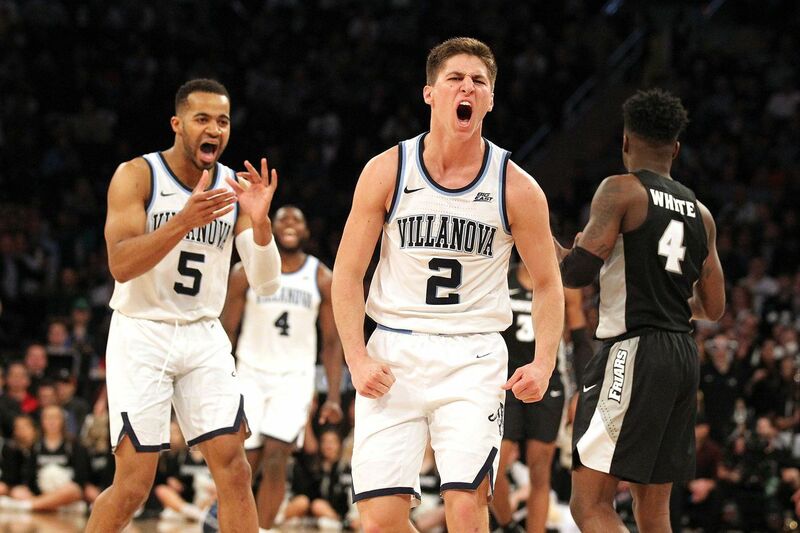 The development of Collin Gillespie throughout his sophomore season at Villanova has been strong if one just looked at the statistics that he’s put up: third on the team in scoring with 11.1 points per game and first in three-point shooting (38.2 percent) and making free throws (83.5 percent). What is not seen, however, is the growth of Gillespie as a leader, reinforcing the messages to the relatively young team that are delivered by senior co-captains Phil Booth and Eric Paschall. The 6-foot-3 guard from Archbishop Wood High School said he is proud of the progress he’s made in becoming a leader on and off the court. “Coming in, we knew we had E and Phil but I think I needed to develop that third leading responsibility just to help the younger guys,” he said Monday when the Wildcats continued to prepare for Thursday night’s first-round NCAA game against Saint Mary’s in Hartford, Conn. When asked what he liked the most about Gillespie’s development, Villanova coach Jay Wright didn’t hesitate. Collin Gillespie, left, of Villanova dives to try and beat Maliek White, right, of Providenceto a loose ball during the 2nd half of a Big East Tournament game on March 14, 2019. In Saturday’s 74-72 victory over Seton Hall in the Big East Tournament championship game, Wright substituted as much as he could depending whether the Wildcats had the ball, inserting Gillespie for offense and Dhamir Cosby-Roundtree for more size on defense. Gillespie provided a little bit of everything in the tournament. He scored 19 points with five three-point baskets and added six assists and three steals in the quarterfinal win over Providence. He scored just two points the next night but his excellent defense, including a charge he took on Naji Marshall as Xavier attempted to win the game in regulation, was pivotal in the Cats’ overtime victory. The game continued a rather unique streak for Gillespie. Going back to his senior season at Archbishop Wood, the Wildcats’ win over Seton Hall marked his 21st win in a row in the post-season, counting nine in the 2017 Catholic League and PIAA district playoff and state championships and nine (three Big East Tournament, six NCAA Tournament) in last year’s championship run. Gillespie will seek to continue the streak as the Wildcats begin defense of their national championship, and hopes they will continue the momentum built last weekend at Madison Square Garden. Villanova holds up their third consecutive Big East Trophy after defeating Seton Hall during the Big East Tournament Championship on March 16, 2019.